At college, it is a lot easier to get lonely than it is when I'm at home. This semester has been somewhat easier with a really close friend as my new roommate and friends and groups that I have gotten to know better. However, none of them compare to the comfort it is to be among my family. Here I just feel so single... When home, I don't feel quite so single, though I technically am, for I have my family around to call my own. After church last Sunday I was very blessed by a family inviting me over to their house for lunch. The dad teaches at Belhaven, and I have gotten to know the oldest daughter who is a junior here. I went over to their house - a family of 8 children, 6 of whom are still at home - and enjoyed helping them prepare lunch, eating the delicious home-made food, sitting around talking until late afternoon, and just being with a family again. There is nothing like the interactions of all ages in one house to make me feel at home. As I helped fill the dishwasher my friend remarked that I may just have to be an extra sister now, to which I replied that I wouldn't mind a bit! God was so wise when He made us to function as families. We glean wisdom from the older members, we learn how to care for the younger ones, we experience sweet companionship from all ages, and learn patience through sometimes irritating circumstances. With them you can truly be yourself, and you learn many things about yourself that you have to change, as your sinful nature is more prone to rear its ugly head. In a family you receive comfort and a sense of belonging. Even when you're not necessarily doing something together, you still feel a peace as you know that they're just in the next room if you need anything. No family is perfect, but through that we also learn to show grace and forgive. Just because I'm not currently living at home doesn't mean I'm no longer a part of my family, but it does make things harder. It takes more work to stay connected, and you don't have the joy of being able to see them many times throughout the day. Phone calls, emails, and letters just aren't the same as sharing a house with them on a daily basis. I was so grateful for the opportunity to be with a family at their house on Sunday. Though we're not biologically related, I felt a closeness and connection with them. It is a beautiful thing how that can happen between those in the body - the family - of Christ. I am very blessed to be a part of God's family, one in which I shall find connections all over the world! In this family God has made a space for each of His lonely children. If you know of any single people at your church, consider inviting them to sit with your family during the service or even come over for a meal once-in-a-while. They won't care if your house doesn't look perfect or if your food isn't the most amazing gourmet meal. They'll just enjoy being with a family and finding companionship with those of other ages. If you're currently a single and are invited to do one of the things mentioned above, don't hesitate. I sometimes turn things down because I don't want to inconvenience anyone, but often people really enjoy being able to help. Bless them by allowing them to provide hospitality. Of course, singles can and should also be hospitable to others! Being alone in situations has made me more aware of how I should be looking for ways to reach out to others to be a blessing and encouragement. It truly makes a difference. 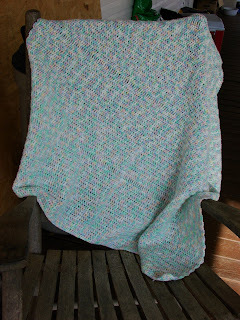 This first blanket is completely crocheted and took about...I actually am not sure how long it took, because I started it sometime last year and then stopped working on it for a while, then picked it back up again last fall and finished it a couple of weeks ago. It isn't intended for anyone but will be there when it's needed. 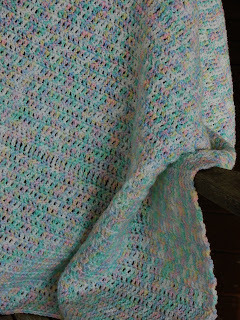 This second blanket is intended for a friend who is expecting. 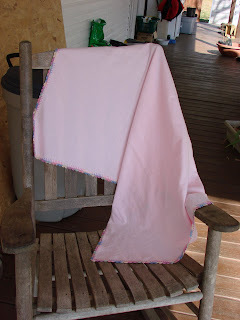 It is already known that it will be a girl, so it made it a little easier to decide the colors. 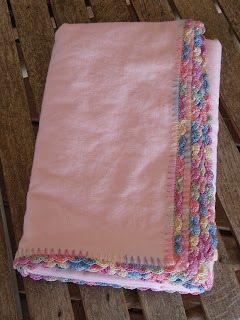 These blankets are my favorite things to make for babies. It's been somewhat of a hard day. It was nothing major, just emotions acting up and trying to get the best of me. I listened to the critical voice inside my head too many times before trying to turn my thoughts back to God and His promises, but it was hard. I've been weepy and downcast, but God is still good. I have to keep reminding myself of that and not get caught up in how I feel at any fleeting moment. Lest my family begins to worry, let me assure you that I am just fine. It's simply been one of those days. They come, and, praise God, they go. When they do come, we are faced with a choice. We can give in and feel blue or we can run to our Father and glory in His strength when ours is gone. We can have a pity party or we can rejoice in all circumstances. We may feel useless, we may question what the future will hold, but we have a Father Who made us unique and priceless, Who will lead us in His ways if we will just follow Him, and Who will never change even when things around us toss and turn. How do we get back on focus? How do we turn our eyes to Jesus instead of our circumstances? The Bible is always a comfort to run to. We must stay in the Word and commit portions of it to memory so that we have verses stored away to combat negative feelings when they come. Sometimes, however, I need to hear things to turn my heart back to the Lord. This evening I turned on the "Worship" CD by Michael W. Smith and let the music and words flood my heart and mind as I stretched and did some strengthening exercises. I'm trying to again implement my 15 minute routine, and the stretching and moving also helped to clear my head! The words soothed my soul and put my focus back on the right Person: God, not myself. "Forever God is faithful, forever God is strong." "I'm coming back to the heart of worship where it's all about You, all about You, Jesus." "Draw me close to You... You're all I want, You're all I ever needed." "Turn your eyes upon Jesus, look full in His wonderful face, and the things of earth will grow strangely dim in the light of His glory and grace." "I'm desperate for You... I'm lost without You." "Holy are You, Lord God Almighty." It seems as though I can't learn this lesson enough. I keep having to again stop stressing and instead put my trust and joy back in the One Who makes this life worth living. His grace is amazing. If you're not already a regular reader of the Girl Talk blog, I encourage you to head over and read about their new series, Shopping for Time. 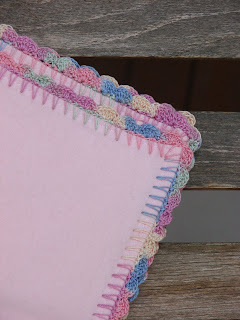 This week they're doing "shop talk" for teenage girls, and their first post, Sowing in Springtime, has some good insights. I'm looking forward to reading the rest of their series, and hope you'll take the time to check it out as well. This hymn is very well known, and many of you probably have the words memorized, as I do. However, it's always good to read or sing through it again and be reminded of the amazing faithfulness of our God. We sang it in chapel this morning, and my heart swelled as I joined the hundreds of other voices extolling our King. This song is definitely one of my favorites, and I have found each of His promises true. Great is thy faithfulness, my Father! You have truly provided me with all that I need, and given me strength and hope. Rest in God's faithfulness today. In the midst of difficult or wonderful circumstances, He will never leave You. Trust in His enduring peace. Being an Aunt brings such great joy! I cherish each visit I get with my nieces and nephews. Yes, there are challenging and tiring times when you care for little ones, but it is so worth it in the end. I was absolutely thrilled when my first niece was born almost 10 year ago, and I couldn't be happier to now have 4 nieces and 4 nephews. There are definitely benefits of being one of the younger children in a family, one of the major ones being the cute and sweet children you get to play with! "Look! My dolly matches me!" I am indeed blessed. Thank you, Luke and Michele and Ron and Maria, for having and raising such sweet children and allowing me to enjoy them! A new semester has begun, and I thought I'd share with you what I'm studying this semester. Classes started on Wednesday, and it is already off to a busy start. I'm taking 18 credit hours, and I hope to learn a lot. Beginning Ballet Technique - I'm still in the beginning level of ballet here at Belhaven, and I have run into some challenges as I try to re-train my body to do things the right way according to the Vaganova method. Though at some times the class is slow and a lot of review, I focus on working as hard as I can and know that I have grown in grace and precision since I started my training here. My prayer is that I will be able to use this to be better able to praise God with dance of excellence. Makeup for the Stage - I've never been very knowledgeable about makeup, especially when it comes to how to apply it for the stage. So, in this class we'll learn a lot about how to apply makeup in order to look like innumerable characters. It should be interesting and helpful. Theatre Ministry Administration - This is the second course for my theatre ministry major, and in it we will continue to explore what it means to be a servant using theatre arts. We will also learn about the logistics of setting up a theatre ministry company, and will be developing a mock company along with mission statement, purpose, and so on. Civilization II - Part of the required worldview curriculum, we will continue to study history from where we left off last semester. We'll be learning about civilizations from the Middle Ages through the Enlightenment. Form and Meaning II - More worldview curriculum, this course will continue where we left off last semester continuing to study the art of past cultures. We'll also begin to study the music of past cultures as well as the art, which I'm excited about. Literature II - Also part of the worldview curriculum, this course will be studying literature that corresponds to the historical period we're learning about in Civilization and Form and Meaning, so that everything is tied together. It's usually quite interesting to hear what the teacher has to say about what we read. Orchestra - It's been very enjoyable to be a part of the orchestra, and I even receive 1 college credit for it! We're playing a pops concert in February, and it has been fun to practice music from The Lion, the Witch, and the Wardrobe and Deliever Us, among other movies. Flute - I'm taking private flute lessons this semester, which shall be a lot of fun. I look forward to becoming more proficient on this beautiful instrument! I was unable to fit piano lessons in this semester, but I'm glad that I get to go more in-depth with the flute. So, those are the subjects that will occupy a lot of my time these next few months. What are the rest of you studying this semester in homeschool, public/private school, college, or on your own? Sorry for the delay in getting this posted! My family dropped me back off at college on Monday, and classes began in full swing today. I've been busy settling back in and recovering from the long trip! 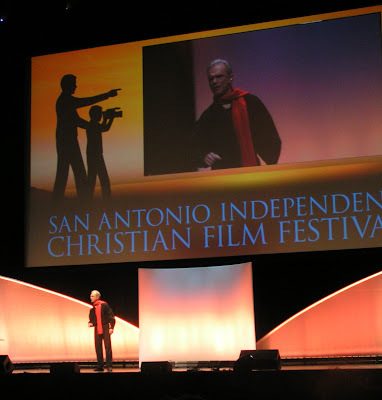 I enjoyed a wonderful week in San Antonio, TX during January 5th-10th and learned a lot at the Christian Filmmakers Academy and Independent Christian Film Festival. Below I shall try to briefly recap each day in San Antonio and share the highlights of the trip. For something more in-depth about each of the speakers and events, head over to The Rebelution's blog where Isaac Harris did a great job live-blogging everything! We had a long drive over Saturday and Sunday to drop Elijah off at LeTourneau University, and we finally arrived at my aunt's house in Sequin, TX, on Sunday evening. After a good night's sleep, my mom and aunt drove me to the Henry B. Gonzalez Convention Center, around 45 minutes away. After picking up the information for the week, we waded through the filled ballroom, looking for a place for me to sit. We found an empty seat near the front, and as I asked if I could sit down, we realized that I already kind of knew the girl sitting there with her dad, brother, and a friend. In God's wonderful way, He led me to Allison and her family, and I enjoyed sitting with them throughout the day, talking with them, and eating lunch with them. I also enjoyed briefly meeting Jasmine, another blogger who I've enjoyed getting to know through the web. The sessions were all very good, and I was encouraged to hear from leaders who are so committed to keeping standards in film and all of life high while bringing God glory. As I listened to Doug Phillips in the opening message, I heard many things that I had long thought, but hadn't been able to put into words in the wonderful way he did. I was inspired and encouraged throughout the day to be unashamed in presenting wholesome art and film to the world. Although at this point I am not a filmmaker, many of the principles I learned can very easily be applied to theatre and dance and all of life. The sessions ran late, and after the drive back to my aunt's house, I soon fell into bed, exhausted, soon after Midnight. 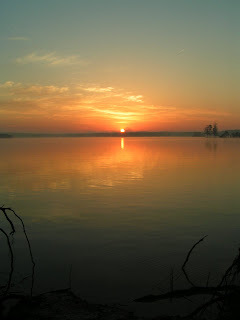 The day arrived too early after the late night, but God gave me the strength to get up when my alarm went off at 6 a.m. I was excited to see what the day would hold in store! As I prepared, I prayed that I would meet people and have someone to eat lunch and supper with. I had eaten by myself at McDonald's the night before, and hadn't enjoyed being alone! It was cold and rainy as I dashed through the raindrops after my mom dropped me off at the curb. I was there a little early, and sat down at a table with another girl named Stephanie, who was soon joined by two of her friends, Jaclyn and John. Throughout the day I enjoyed sitting with them and learned that they were a part of Dallas Christian Filmmakers, a group I had heard about before. I was also able to eat lunch and supper out with them, and I enjoyed making new friends! The sessions were, again, very interesting and applicable. I enjoyed seeing the stunts of Jimmy Broyden and hearing from Doug Phillips, Geoffrey Botkin, and Isaac Botkin in addition to hearing about a Panavision camera. I was really impressed by how well the speakers wove theology throughout the lectures and stressed the importance of planning and praying and making sure everything was done with excellence. This was the last day of the "Technical Boot Camp for Aspiring Culture Changers," and though Tuesday night wasn't as late as the one before, I was still pretty tired from lack of sleep. Each session was very enjoyable, however, and the day outside was beautiful. I enjoyed eating lunch outside and relaxing for a few quiet moments. There were many filmmakers who shared that day about the lessons they'd learned through the movies they'd made, and it was very encouraging to hear from them. Stephen Kendrick was especially enjoyable to listen to, and everything he said continually pointed away from him and his church and to God to bring Him glory. His humility and consistency in praising the Lord for everything they've done was truly humbling and encouraging. The academy finished around 6:30 p.m. and I picked up my official diploma and drove back with mom for one last evening at my aunt and uncle's house. I was so exhausted! I managed to eat supper and help with the dishes, and then caught up a little online and read some before settling down for a longer sleep. It was another beautiful day in Texas! Dad, Lydia, and Jubilee had driven most of the way from home the day before, and they joined us for a delicious breakfast that my aunt prepared. After packing up and helping with a few things, we headed off to check into our hotel in San Antonio and register for the film festival. I was glad to have some more of my family with me again, and was excited to see as many of the films as I could possibly fit in! After registering, we walked over to the food court to each lunch. I had us pose for a picture on a bridge - stair-step sisters, 5 years between each of us, with each possessing a varying shade of reddish hair. We got back to the convention center around an hour before the first films started, so we found a corner and enjoyed a rousing game of Dutch Blitz! It was a great way to pass the time, and we met some people as a result as they wandered over to see what we were so busy playing. We played more games as we waited in lines and for films to start over the next few days. It was fun! 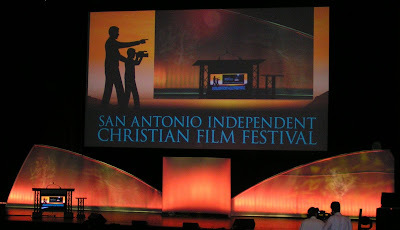 After watching a few films that afternoon, and going out to eat delicious Mexican food at the Casa Del Rio on the riverwalk, we settled down in the beautiful Lila Cockrell Theater for the opening ceremonies. The air was electric with excitement as the seats were filled. My favorite part of the evening was watching George Sarris present word-for-word from the Bible the story of Joshua and the battle of Jericho. He is always very inspiring to watch, and I even got some ideas of perhaps writing a musical about this very exciting story. We'll see how God leads, but it was exciting to have scenes simply pop into my head as I watched him present dramatically from the Bible. Another fun event was being able to hear Charlie Zahm sing. This great balladeer has an amazing voice, and he sang songs about 1,000 years of Christian Heroism, alternating as Doug Phillips narrated. After watching more films, we walked back to our hotel around Midnight, excited about the days that were ahead. 6:30 a.m. came rather too quickly, but we excitedly got ready and even got to the convention center early! The day was filled with watching film after film. It would take too long to give you my thoughts on each film I saw, but my favorites of the day were Hidden Tresure, a hilarious modern retelling of the Biblical parable about the treasure found in a field, Wars of Humanity III, a lego animation movie showing the battle of Jericho and made with high quality, and The Widow's Might, a movie I'd long anticipated seeing after enjoying the other films by John Moore and his family. It was even better than the previous ones in the "Siblings" series, and the musical aspect was very well done! It was definitely my favorite of the festival, and I cast my vote for it for the "Audience Choice" award. The day was a most beautiful one, and I enjoyed eating by the river and walking oustide along it during breaks. It was a warm day and the atmosphere was lovely and relaxing. That night we enjoyed attending the world premier of 3 short and well made Biblical films put out by Crown Financial Ministries. We also heard inspiring talks from Dean Jones, Stephen Kendrick, and Kirk Cameron. The Von Trapp Children also performed beautifully that night, singing many well-beloved songs. They sang acapella, and their voices blended together in beautiful melodies and harmonies. It was truly a delight to hear. We were all tired as the morning came again, but we all anticipated another enjoyable day watching films. Near the end of the day I was pretty tired of sitting so long and getting somewhat restless, but each new film soon caught me up in the story! 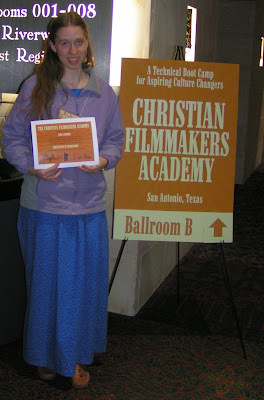 After taking the filmmakers academy, it was interesting to watch the films with things I'd learned in mind. It made me notice a lot more that I'd never really thought of before, especially in terms of music and camera angles. My favorite films from the ones I saw that day were Pendragon, a truly epic film set in the Dark Ages, with stunning detail and effects made by two families of cousins, Dad the Hero, a funny story about a dad and imaginations of the Wild West, and Click Clack Jack, a heartwarming and hilarious story about a train engineer. As the films came to a close, it was so refreshing to know that out of the 29 films I'd seen over the past 3 days, not one had contained anything inappropriate. It was such a wonderful feeling! We enjoyed the closing ceremonies that evening, as everyone excitedly waited for the winners to be announced while enjoying George Sarris' word-for-word presentaion of the Biblical story of Elijah and the prophets of Baal and songs from Charlie Zham and the Von Trapp Children. Each of the winners did an excellent job with their films, and I was especially excited to see The Widows Might take away both the "Audience Choice" award and the "Best of Festival" award with $101,000! Great job to Heumoore Productions and the writer, director, producer, actor, and singer in the movie, John Moore, winning such a large prize at "only" 19 years of age. We all look forward to what they will do in the future! After another late night, the festival came to an end. It had been an exhausting but rewarding week. The things I learned, saw, and experienced are a wonderful memory that I shall treasure. No matter what I do, cinematography or otherwise, the lessons I learned that week will stay with me. Thank you so much, Dad and Mom, for allowing me this amazing opportunity! My time at home has come to an end for another semester. It has all passed so quickly! It has been wonderful to spend time with family and friends and be able to do many of the homey things I enjoy so much. This past week we've had my sister Miriam and her husband (my new brother!) John here, as well as my sister Maria and her husband Ron and their three children, James, Sara, and Lisa Beth. It has been quite fun! On Tuesday we went on a 4-mile or so bike ride! We used to go on long bike rides quite a bit, but this was the first one in a while, and it was a lot of fun! We biked over to the place our neighbor's horses are boarded, and it was a pleasant ride. The day got rather warm and we were rather tired by the time we got back home, but it was fun to be together and good exercise! Everyone enjoyed petting the little kid goats and chasing those that didn't want to get too close. Behind us is a horse that is also boarded there by someone else, and he was very friendly, wanting a lot of attention! Sister pictures are always fun! Here are the four of us sisters that are all 5 years apart. Miriam (center) is 28, Lydia (right) is 23, I'm 18, and Jubilee (top) is 13. On Sunday the 11th, a week from tomorrow, I'll be dropped back off at college as the rest of my family heads home. Classes start on January 14th, so I'll have a few days to recover before jumping into a busy semester. So, don't expect to hear much from me this next week! I may have limited computer access, or perhaps none at all. I hope you all have a great week! Where this year ahead will lead. God will give us what we need. With my Father by my side. Spreading grace and mercy wide. God has proved Himself again. Through joy, uncertainty, and pain. He purposes come to be. He still knew the best for me. When I knew that I did lack. He always took me back. My Rock and Fortress true. He has made His mercies new. With a new act being cast. Seem even swifter than before. As we open this year's door? What this year ahead will bring. And He is always good. Far better than I could. Give in to stress, doubt, or fear. I will be strong with my God near. I will trust and follow God. My prayer for this year? That I will serve and bring Him laud. we pray you all have a blessed New Year!